Edith’s big day. Image source: screen grab from pbs.org. After last week’s uplift and hilarity — the long-awaited wedding of Mary and Matthew; the steamrolling force of Shirley Maclaine’s Martha — this week pulled the rug out from under us. That is, a team of servants rolled it up and hauled it away. Edith may be radiant, but not everyone is smiling. Lord Grantham continues to glower about the upcoming nuptials, convinced Sir Anthony is far too old for Edith: there are many mutterings about how she’ll wind up wheeling around an old man in a chair. Violet feels the same, and even Sir Anthony seems worried on this point. Nevertheless, the flurry of wedding preparations continues apace. And really, Lord Grantham has much to feel grim about. As soon as Edith leaves on her honeymoon — Rome! Florence! she’s in rhapsodies at the thought — Robert is going to put Downton Abbey on the market. The family will relocate to a “small house” Robert owns on the side, farther out in the country. The family plans an impromptu picnic to check the place out, the day before the wedding. Because, you know, Mrs. Patmore doesn’t already have enough to do. 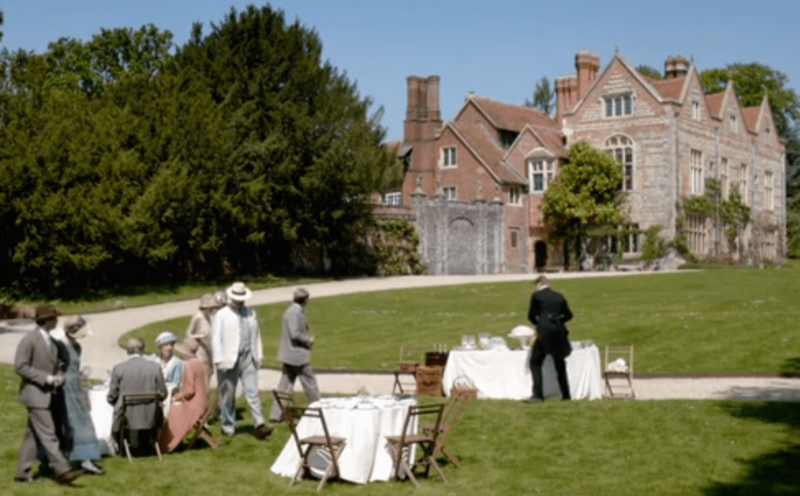 “Downton Place” — what a hovel. Image source: screen grab from pbs.org. Belowstairs, the servants have much on their mind. Mrs. Hughes is still awaiting the results of her biopsy. Carson eavesdrops, wrangles a bit more info out of the doctor and then Mrs. Patmore, and promptly begins treating Mrs. Hughes with exactly the kind of deathbed concern that made her swear Mrs. P into silence in the first place. Meanwhile, Thomas and O’Brien are ratcheting up the stakes in their feud. Thomas plants a rumor with Moseley, the hapless pawn, that O’Brien is planning to leave. Mosely stumbles right into the trap, catching Cora by surprise and causing Much Consternation. Before the episode is over, O’Brien will figure out Thomas’s role, and her ominous threats of retaliation leave Thomas visibly worried. Detective Anna continues to pursue her leads, paying a visit to Vera’s friend, Mrs. Bartlett, who takes a fee and sneers that she has nothing to say. She hates Anna, the “trollop” who stole Mr. Bates from his wife, as far as Mrs. B is concerned. But she does cough up a description of Vera’s odd behavior the day she died: anxious, jumpy, expecting a visit from Mr. Bates and afraid of him, says Mrs. Bartlett. “Fearful but determined,” scrubbing pastry out of her nails. YOU GUYS, Vera was going to poison HIM. That’s my theory. Now how did she come to eat the arsenic pie herself? What happened in that encounter? Daisy, intrigued by Alfred’s fascination in the brazen American lady’s maid from last week’s episode, wonders if she ought to experiment with being more outspoken. She’s been so sullen lately; a little outspokenness would be a welcome change. I miss the old Daisy who used to blurt out inappropriate things all the time. The entire episode hinged upon words spoken and unspoken, read and unread. Matthew has received a letter from Mr. Swire, but he won’t read it — can’t bear to endure the undeserved “paean of praise” he’s certain the letter contains. Mary is fit to be tied over this impressive stubbornness. (“My God, do those two deserve each other,” said my husband.) Eventually she takes matters into her own hand and reads the forbidden letter. Turns out Lavinia wrote to her father the day she died, telling him what a mensch Matthew was — determined to marry her out of honor although his heart belonged to another. Mr. Swire knew all, forgave all, and Mary is triumphant: Surely now Matthew will use the money to save Downton. Or not. Matthew decides the letter must be a forgery. He stops short of accusing Mary of faking the letter — good thing, because I think she was about to chuck at candlestick at his head — but since nobody ever said anything to Matthew about Lavinia mailing a letter from her deathbed, he’s convinced it’s not legitimate. Mary, galvanized into action by her fear of losing Downton, does a bit of detective work, grilling the servants about this mysterious Lavinia letter. Glory be! Daisy, for once outspoken in exactly the right way, reveals that she knows all about it. Matthew’s scruples can be laid to rest. Downton Abbey can stay in the family. Happy endings all around, right? The family rallied around Edith beautifully. Last week we saw Cora reach out with incredible warmth and understanding to Robert over the bad investment, her lost fortune. This week, I thought it was her most shining moment yet, shooing away the other girls (married, pregnant, their very existence salt Edith’s wounds), embracing Edith, “You are being tested.” It was the best, most perfect, only possible thing to say. Cora, too, has been tested, and like Edith, she has grown warmer and wiser. In an episode when people keep saying the wrong things, or not saying the right ones — Anthony’s fatal silence, Mr. Carson’s bumbling phrases about an illness he pretends to know nothing about, Thomas’s “honest mistake” which is anything but, the salvific letter Matthew wanted to burn rather than read, and even Tom the Revolutionary has been “tamed” (for now, at least) — Cora finds the right words, the potent words, the words both honest and kind. 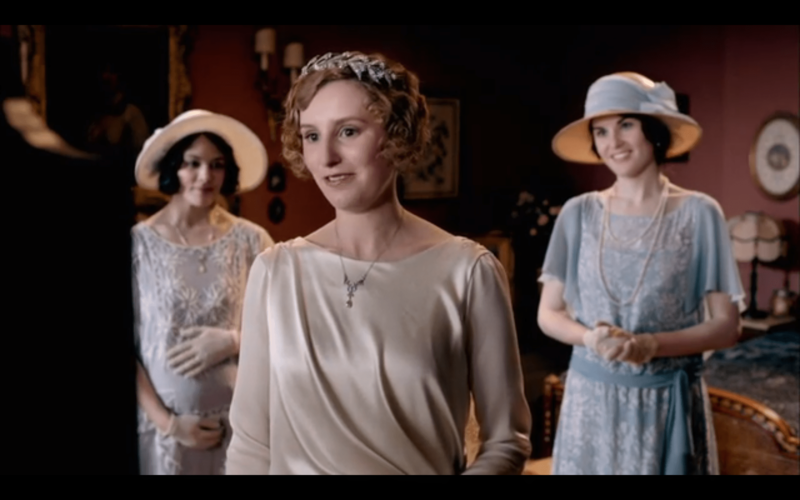 It was one of Downton Abbey ‘s best moments to date. In the end, Edith rallies. Grimly, brokenheartedly, rising to do a spinster’s duty. “Spinsters get up for breakfast.” Image source: screen grab from pbs.org. Downton is saved, Bates escapes a minor frameup in prison, Anna’s half a step closer to the truth, and Edith will, it seems, come out of this dark moment stronger than ever — but what kind of stronger? A good one, I hope. And what’s your take on Mrs. Hughes? Is the good medical news for real? I’m not convinced. For last week’s recap and discussion, click here.